DIY Skateboard | Secrets to building skateboards on your own from scratch. For all the Do It Yourself people you can now find boards that you can reshape or finish on your own. There are tons of places giving you info on how to build your own press or show you how to use a vaccume to glue your own decks. We have taken this step of the manufacturing process out. These decks we have set in our DIY section are cheaper then doing it yourself. Stay Tuned we will be adding product here for Diy Projects. We have a plan and it involves you! 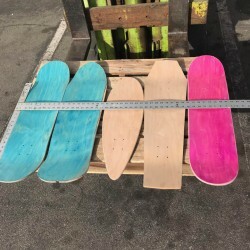 The DIY Skateboard market has created a long term struggle that is limited to what is right before our eyes or years of study and persistence. Dedicated to bringing out new products to help your next DIY skateboard project. 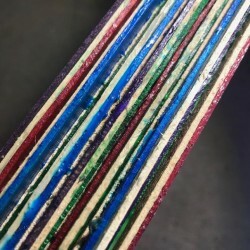 What you have all been waiting for is this flat press skateboard material for your recycled skateboa..
Start with buying a set of Diy Skateboards from customskateboards.com Once you have them in your hands set up a time and place that allows you to make dust and have the proper tools to finish these already glued up decks. You can used a laminate trimmer to round the edges or a sander with some rough heavy grit sandpaper to break the edges of these skateboards. Some of these boards in the DIY packages will have the rails already sanded you can re cut them or keep them the way they are. Skate them or paint on the bottom your graphic and skip this step. You want to find a well ventilated area to paint the boards. If you are using a lacquer you find in Home Depot out of a spray can make sure you use a respirator or do it outside with the wind blowing on your back to make sure the fumes are moving away from you. Once you have sealed your deck you can use just about anything to paint your design or just go out and skate it. For those who want to put a graphic on it give yourself an extra layer of lacquer on top of your design to protect it further from scratches and the weather.